Every family kitchen needs a go-to chocolate chip cookie recipe. These are perfect for an Easter potluck or as a bright addition to your own Easter table. 1. Preheat oven to 350°F (180°C). Line two baking sheets with parchment paper; set aside. 2. In a large bowl beat together butter and both sugars until smooth. Mix in your eggs and vanilla. 3. In a smaller bowl whisk together flour, baking soda, cinnamon and salt. Stir into wet ingredients. Pour in your chocolate chips and mix well. 4. Drop rounded teaspoonfuls of mixture onto parchment lined baking sheets about 1 to 2 inches apart. 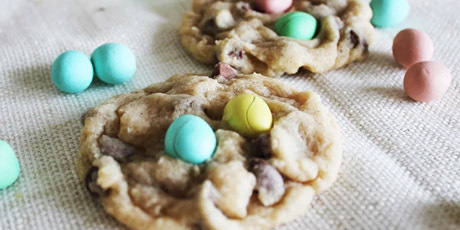 Next gently press 2 chocolate eggs on each cookie. 5. Bake in oven for 8 to 9 minutes, turning and rotating pans half way through until edges are lightly browned. 6. Let cool completely on racks. Can be frozen for up to two weeks.